Don’t you love to sit down with a good book, or better yet, a book that’s crucial to your research, and find that someone before you has treated it like their personal property? Don’t you love to encounter a book through the eyes of its previous readers, and have your own eyes uncontrollably drawn to the passages THEY thought were important? And don’t you really love their little comments scribbled in the margins, showing how smart they are? 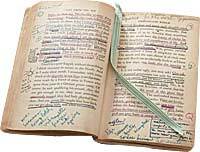 Seriously, while wear-and-tear on books is expected, writing in library books, underlining, folding down page corners, removing pages – all of these are basically a form of mutilation. The books in the library are for everyone, so we ask that you PLEASE not treat them as if they were your very own! You can of course buy cheap copies of most of the books you find in the library. Amazon.com is the best source to begin with. It often has used copies that are cheaper than new ones. And often you can find a used copy “like new.” Half.com, an eBay relative, is also a good place to find cheap books, usually read once then offered back to the marketplace. ABEbooks is a great place to find out-of-print books, but it also has lots of print on demand titles available. And there’s always Charles Village’s own Book Thing for free books. You can read books online, at Google Books or the Internet Archive. And you can find e-books in our catalog, that you can download and “mark up” all you want. Limit your search by Format to “Online,” and see the amazing variety of e-books available. Many of these e-texts can be printed out, and then you can underline to your heart’s delight! So next time you’re tempted to get out the old highlighter, think again! Think of the next reader who will use the book, and put the top back on it. And if you come across a book that is, well, mutilated, bring it the attention of the appropriate Subject Librarian. Or, when you return it to Circulation, ask them to put it on the damaged book cart. A librarian will review it and order a new copy if appropriate. Texts Online, Part Two: Where is the free stuff? Where do all these books COME from? Have you tried Google Books? Don’t forget Normal’s used book shop, just around the corner from Book Thing, another great local place for book lovers!